My name is Ryan Douglas and last year I graduated from Edinburgh University. This is the story of how I got involved in the food and drink industry and why I intend to stay there. During my time in Edinburgh I studied Biological Sciences, featuring everything from molecular genetics to behavioural ecology, plant science to biomedical. In the summer of second year, an opportunity arose called the Gatsby Plant Science Summer School. I wasn’t particularly interested in plants, but I enjoyed the plant science modules I’d done before and the whole thing was free so I figured I had nothing to lose. While at Gatsby I developed a keen interest, erring on passion, for plant science. I realised that it wasn’t one subject, but was actually a fascinating collage of separate disciplines centred around a common theme, linking fields as diverse as ecology, molecular genetics, and sustainability. As interesting as it was, I still longed for something more practical and applied; less thinking and more doing. Then someone handed me a leaflet: Harper Adams Fresh Produce Summer Internship. It was one of those elusive must-haves in the early career of a budding scientist; an internship. Run your own applied crop science research project in the grounds of the country’s finest agricultural learning institution, under the supervision of renowned plant scientists, with a rich itinerary of visits to some of the key players in the fresh produce industry. I applied immediately. My experiment at Harper was a preliminary study for a project which looked to improve crop genetics by screening for abiotic stress tolerance. I thoroughly enjoyed every aspect of it; discussing ideas, setting up trials, analysing the data, and sharing my results. I made some great friends, worked with some very talented people, and learned a lot about applied plant science. I also thoroughly enjoyed the industry exposure. We visited around 10 growers and processors throughout England, with a product range encompassing everything from lettuce to sweetcorn to watercress. The world of fresh produce business was new to me, but not unfamiliar: growing up on a farm had given me some useful, relevant knowledge and I found myself drawing parallels with my own experience. For me, these remain some of the key attractions to this industry. In fresh produce you can’t sit idle with business as usual; you have to run just to keep up. To make a profit with the smallest of margins while at the mercy of the weather and crop disease, by dealing with people from all over the world in order to grow and supply food more sustainably. This industry is full of excitement and challenge, from the often intense day-to-day operations to the long-term, global problems that industry and science must tackle together. Throughout the Harper placement we kept hearing mention of Management Development Services Ltd. This company was setup 30 years ago by a group of fresh produce growers keen to develop the next generation of managers for their businesses. Funded by the growers, MDS selected and trained graduates with high management potential, who would hopefully then work for the member companies. It turns out that most of the companies we visited were MDS members and many of the senior managers we spoke to were MDS alumni. The modern MDS graduate scheme consists of four, paid 6-month work placements at a selection of member companies operating in the food and fresh produce industry. The roles provide exposure to the intricate supply chain encompassing growing, processing, commercial, marketing and other sectors. This first-hand experience in real management jobs, with real responsibility, combines with 25 days of tailored, world-class management training provided by renowned institutions and lecturers to set graduates on a path to becoming high calibre managers in this unique industry. The scheme currently outputs 20 trainee managers annually to a pool of around 35 member companies. The membership is a myriad of growers, suppliers, and retailers, from a 4-person health food start-up to an agrichemical conglomerate with a turnover of â‚¬50bn, and everything in between. Joining MDS also grants you exclusive membership to a distinguished network of trainees, alumni and member companies, which contributes to their virtually 100% employment record. 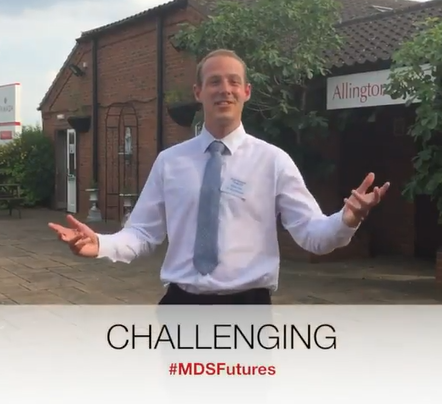 Just as fresh produce is no ordinary industry, MDS is no ordinary graduate scheme. I’d never really considered a career in management. Or a career in food and fresh produce. But in the following months I met with the university careers service who helped me draft and redraft the perfect application. This led to an intense, thorough interview and then â€“ my confirmation phone call! Another gear had clicked into place: I could enjoy my summer knowing I had a fantastic opportunity awaiting me. A key part of the MDS interview process is ensuring that you know what you’re in for and that you’re up for the challenge. In each placement you have just 6 months to adjust to a new location, company, and group of colleagues, learn and master your role, and ultimately demonstrate your ability and potential to a possible future employer. I’m now halfway through my MDS journey and it’s been everything I hoped for and more. My first placement saw me running the entire poly-tunnel operation of the UK’s largest forest nursery, coordinating multiple projects and over a dozen employees. My current placement is in one of Europe’s largest banana ripening and packing facilities, directly managing a team of 20 people, and planning and organising a total staff count of over 100. I had relatively little management experience going into this scheme, but my passion for the industry and my desire to learn granted me an opportunity that I have seized with both hands. At times, it’s been hard. Really hard. But the support of my secondment managers and the staff at MDS have helped me overcome challenges and achieve goals I never thought I could. I intend to continue to work hard, grasp every opportunity, and get as much out of this unique and invaluable experience as I can. The UK food supply chain today generates Â£110bn for the economy and employs almost 4 million people. Food and drink is the UK’s largest manufacturing sector by turnover, bigger than automotive and aerospace combined. The wider industry, and fresh produce in particular, has a shortage of skilled managers which MDS, in collaboration with its member companies, is committed to addressing by increasing annual trainee intake, the number and variety of member companies and building on the already world-class training programme. If you read this and are inspired, then great! If you read this and are daunted, then I say you don’t know what you’re capable of until you try.